903cc 8 valve transverse four with double overhead cams and 4x 28mm Mikuni CV carburettors. 5 speed gearbox and chain drive. Steel tubular frame with twin rear shocks adjustable for preload. Single sliding caliper 296mm disc brake to front, 200mm drum to rear. It feels like yesterday, but it also feels like a hundred years ago. I'd just passed my bike test on a borrowed Honda CB100N, was racing my 350LC and needed something sensible to use as everyday transport. Well, OK, I needed something reliable that I probably wasn't going to crash or explode on the racetrack. The obvious solution was a seven year old Kawasaki Z1A, the second model of the iconic Kawasaki Z1 whose coming of age we are celebrating here. 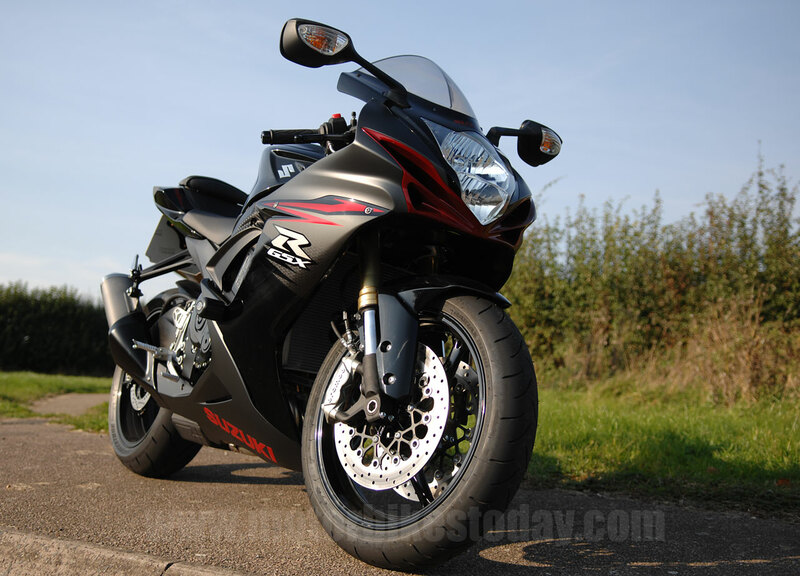 We all know that Honda beat their arch rival Kawasaki to produce the first four cylinder production road bike. 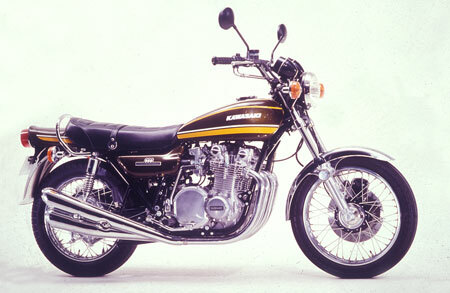 But while the CB750 was certainly a landmark, it never really grabbed us in the way that the big Z did. And being a Kawasaki, it didn't grab us gently. Or in a sporting place, for that matter. No, it reached out and grabbed us firmly by the tenderest parts a chap can have, and told us in no uncertain terms that if we took liberties with it then those tender bits would be forfeit. Along, it must be said, with the rest of us if we were unlucky. Let's get this straight. 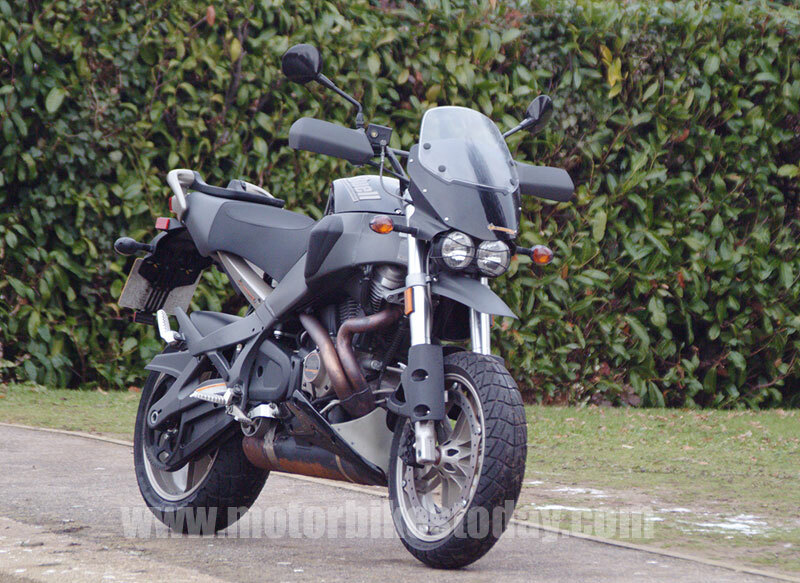 Looking at it from a 21st Century perspective, in no way was the Z1 an especially good motorbike. True, the engine was astounding for the time, producing a real eighty two horsepower. But the cycle parts were not up to the job of containing all that power. And I'm being kind. The forks were spindly to the extent that I honestly think you could replace them with milk shake straws from your favourite fast food emporium. The frame was well made but still not up to the job. I followed a friend down the road when she was riding my Z1A, and when she cracked the throttle open I could actually see the rear wheel move sideways as the swingarm flexed. Not good. Then there were the brakes. Or rather, there weren't. A single disc ont he front with a sliding caliper and a drum on the back. That's not sufficient to stop over a quarter of a ton of motorbike in anywhere near the time or distance you'd expect. So what was the Z1 like to ride? Well, I have to remind you that I came to this magnificent machine from a small and rather frantic two-stroke twin. So there was a world of difference, but I'll be as objective as I can. Size. The Z1 was, and is, a big motorbike. But not unreasonably big, and in reality not massively bigger than, say, a Triumph Trident or even a Norton Commando. It was rather wider than either of these, though, which made it all feel a bit at first, especially the first time you swung a leg over it. There's no doubt that it was bloody heavy, but it was extremely well balanced and my dropping it at a set of lights was my fault entirely. It was, however, rather interesting trying to get out from underneath it. Anyway, I digress. The main thing which leapt to the forefront of everything was the same thing that made the Z1 so different in the first place. That stonking engine. I'd ridden other fast bikes. My LC was pretty quick, for a start, and I'd also ridden British bikes, particularly the aforementioned Commando and Trident. The Trident in particular is often referred to as the first modern superbike, and indeed the 750 triple produced a healthy fifty eight horsepower while having a similar wet weight to the Z1. The LC was a probably about eighty kilos lighter, wet, and produced around ten horsepower less, which certainly gave it plenty of get up and go. Now look at the Z1. Kawasaki claimed eighty two horsepower. Even if that's optimistic, everyone's claims were optimistic in those days, so the relative difference remains about the same. More than fifty percent more power than the most powerful British production bike, and a similar weight. Nearly double the LC's power. It truly felt as though it would accelerate for ever, and it was oh so smooth after the finger-numbing vibration of the parallel twin two stroke. No balance shafts in those days, of course. The performance was shattering. It was still considered something of an achievement to do the ton - hit a hundred miles per hour - but the Z1 punched through that magic number and just kept on pulling. I had never ridden anything like it. The handling wasn't as razor-like as I remember the LC. I suspect that the LC didn't handle like I remember either, to be fair. I'm pretty sure that the Z1 went where it was pointed, though it did have a bit of a weave in long fast sweepers. But it took a lot of effort to get it turned, and you could pretty well forget changing line once you'd turned in. It was a bike which required, more than anything else, forward planning and commitment. That included braking. Now again I suspect that my memory is slightly rose tinted. But the LC weighed a lot less than the Z1 and had twin front discs as standard. It really stopped well for the time. The Z1 didn't. To be fair again, contemporary British bikes had impressive looking brakes that weren't really all that great either, but with the performance on tap the braking really was inadequate. What else. Ah yes. the noise. Inevitably the beautiful standard exhausts were dumped for a four into one. I'm not sure what it was, but it probably screwed up the fuelling and, in hindsight, ruined the look of the bike as well. But it sounded fantastic. You may think that this is a pretty lukewarm review, but you'd be mistaken. It's difficult to take thirty three years of riding different bikes, right up until today, and filter out all the more modern experiences. No mid-70's motorcycle will stand up to scrutiny when applied with present day criteria. Even Harleys, which haven't changed that much but are far, far better made. 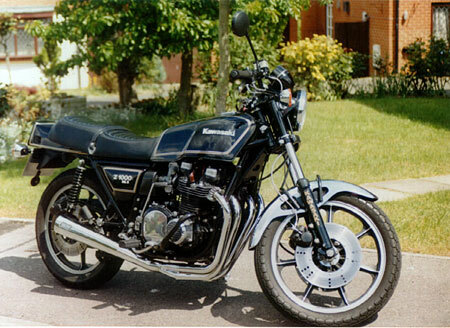 Doing my best to make comparisons from the time, it's obvious to me that the Z1 was a truly outstanding motorcycle. 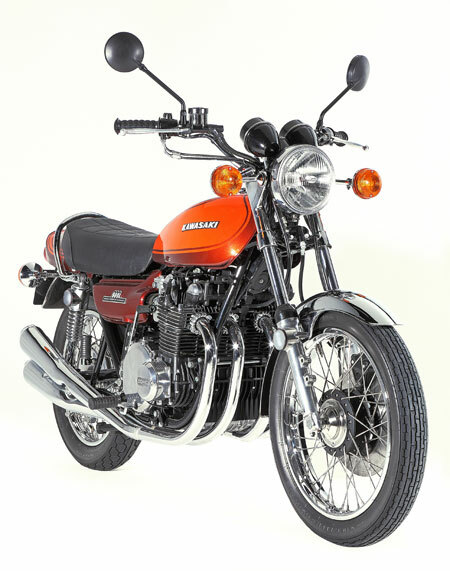 Kawasaki carried on producing, and selling, bikes based on the air cooled eight valve DOHC four right up until the late nineties. That's over a quarter of a century of direct lineage, and there's a reason for that. It's simple. The kawasaki Z1 was, quite simply, right. It was right then, and if you'd never ridden a liquid cooled, fuel injected superduper rocketship bike from today then it would still be right. It's one of the very few bikes that I wish I'd kept. Because I loved it.